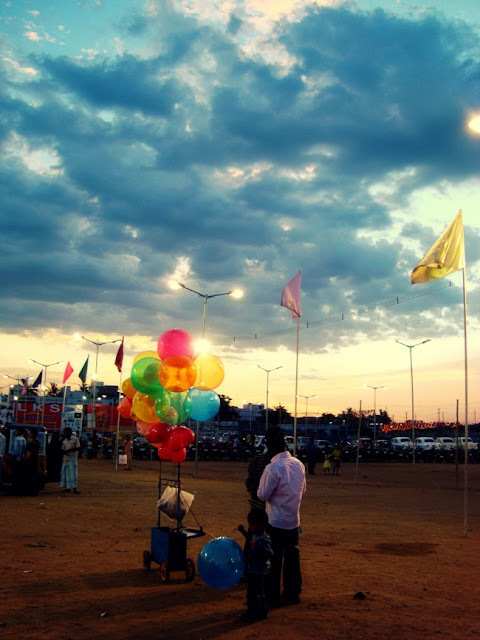 Trichy has always been about new experiences, every single trip there. We had once visited an exhibition on one such trip, with tiny stalls and rides for kids. Found Dora stickers for my niece! (If you haven’t already heard of Dora, I'm guessing you either don’t spend time buying stuff for kids or your kid fancies Barbie). I tried some local fruit & milk based drink there for the first time too - still not a fan. I liked how this photograph turned out. I want a balloon.